Today, 8/1/12 (Day 7) – ALLEUIAH, THE HUNGER PAINS HAVE SUBSIDED! I no longer have sugar cravings. I have completing converted to Truivia, which is ten times better and sweeter than Purevia. I have to admit that I did not eliminate coffee as instructed in the Challenge. I decreased the coffee from three 16 ounces to one 16 ounce cup a day, half caffeine. This is HUGE for me because I LOVE coffee. There are two coffee makers on the kitchen counter: a Keurig for that quick one cup of coffee and hot chocolate for the girls and a Mr. Coffee. It’s a generation thing, I grew-up with Mr. Coffee. GOOD GRIEF! You will notice that Lucy creeps in and goes off in her own world. 🙂 Back to the Challenge… I feel comfortable on this Challenge. In order to succeed, I have to plan out my meals. Yesterday, 7/31/12 (Day 6)- my first day in the office being on the Challenge. I didn’t plan out any meals. 🙂 I grabbed some yogurt, fruit and I was out the door. My work day starts at 7:30am. Around 10:00am, I’m starving. I mean STARVING! I wonder why am I feeling this way? I realized I didn’t have anything to eat. So, I ate everything I had on hand: yogurt, apple and orange. WORK, WORK, WORK…. 2:00pm arrived and all I had was water. The cafeteria grill is closed and salad bar is being shut down. I got pissed! “2:00pm is too early to shut down everything! SMH, I grab two boiled eggs and head back to office. In the past, I would grab a cup of coffee, protein bar and be on my way. 6:00pm time to go home and I AM STARVING. I head to the vending machine. I know the vending machine aka portable sugar dispenser. I scan the sugar products and my eyes go to a Special K crisp bar; hmm… flour no good. So, I choose a beef stick. Even though it’s not on the “approved foods” list, it’s protein. Now, the craziness begins. The gives me the beef stick AND my money back. INSTANTLY, LUCY arrives. “This is a sign!” “You’ve been doing so good, God wants you to have a treat”. I smile and nod in agreement. I can imagine what I looked like on the security cameras. 🙂 My body immediately jumps to starvation mode and the sugar craving have returned. Like a kid in a candy store, I’m EXCITED, eyes darting across the rows, popcorn, pretzels, Snickers, Payday, Starbursts, Gummie bears…. 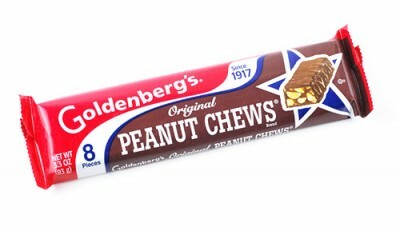 I choose the Peanut Chews, which were my mom’s favorite when I was young girl. Lucy emerges, “This is good..its chocolate, which is good for you and peanuts are protein.” I insert the coins that we’re returned, the Peanut Chews drops to the bin then…. I get my money back AGAIN. Before, I have another LUCY moment, out loud, I say, “This machine is broke.” I collected the coins and left QUICKLY! On Monday, 7/30/12, (Day 5)- I cheated with a 2010 Bodega Navarro Correas Malbec. How could I resist?! I went away for the weekend and I haven’t seen The Professional in four days. He sent a message, “I bringing over a Malbec for us to try.” (My kinda guy). It was delicious; full-bodied, berries flavors with a hint of spice on the finish. I talked to Lucy quite often and find her to be very interesting. She’s all over the place that’s what makes her so special.